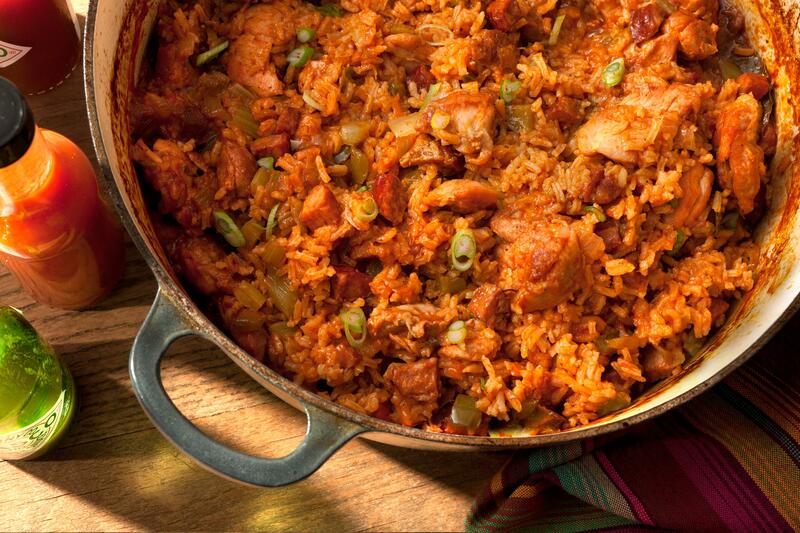 Sure, you may have heard of Gumbo, but do you know where it got it’s name from? Well, we can’t be 100% sure, but we do know that the dish we know as Gumbo originated in southern Louisiana from the Creole people during the 18th century. It typically consists primarily of a strongly flavoured stock, okra, meat or shellfish, a thickener, and seasoning vegetables, which can include celery, bell peppers and onions. 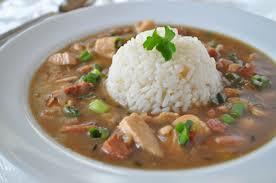 Gumbo is often categorized by the type of thickener used: the African vegetable okra, the Choctaw spice filé powder (dried and ground sassafras leaves), or roux, the French base made of flour and fat. The dish likely derived its name from either the Bantu (Native African) word for okra (ki ngombo) or the Choctaw (Native American) word for filé (kombo). The dish is the official cuisine of the state of Louisiana. The recipe below actually uses all 3 types of thickeners, though the filé powder is optional (more for taste rather than a thickener). In my mind, 3 is better than 1! This recipe will serve about 6 people. * Cook’s Note: This recipe calls for the use of sausage; you can use any type you like, though if using a raw one, I suggest either completely removing it from the casing and cooking it up like ground meat, or cooking it whole with the casing still on, then slicing it up thick and adding it to the pot later. Just be careful when stirring the dish later that if you’ve cut up the sausage that it doesn’t crumble and break up too much! Remember, save the drippings from cooking the sausage, and use it in place of oil in this recipe. It adds so much more flavour than regular cooking oil! Make a roux by whisking the flour and ¼ cup plus 2 teaspoons oil/sausage drippings together in a large, heavy saucepan over medium-low heat to form a smooth mixture. Cook the roux, whisking constantly, until it turns a rich mahogany brown colour. This can take 20 to 30 minutes; watch heat carefully and whisk constantly or roux will burn. Remove from heat; continue whisking until mixture stops cooking. Stir the vegetables into the roux, and mix in the sausage and chicken breasts. Bring the mixture to a simmer over medium-low heat, and cook until vegetables are tender, 10 to 15 minutes. Remove from heat, and set aside. Bring the stock to a boil in a large Dutch oven or soup pot. Whisk the roux mixture into the boiling stock. Reduce heat to a simmer, and mix in the sugar, salt, hot pepper sauce, Cajun seasoning, bay leaves, thyme, stewed tomatoes, and tomato sauce. Simmer the soup over low heat for 1 hour; mix in 2 teaspoons of filé gumbo powder at the 45-minute mark. Meanwhile, heat 2 ½ teaspoons of oil or sausage drippings in a skillet, and cook the okra with vinegar over medium heat for 15 minutes; remove okra with slotted spoon, and stir into the simmering gumbo. Continue to simmer until flavors have blended, 45 more minutes. Just before serving, stir in 2 more teaspoons of filé gumbo powder. Serve over hot rice.